One November evening in 1987, a deadly fire broke out at King's Cross, London's busiest Underground station. 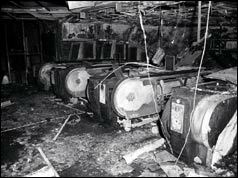 It started in a machine room under a wooden escalator and turned into a huge fireball that engulfed the ticket hall and filled it with smoke. The smoke could be seen coming out of the station's street-level entrances as screaming passengers ran out. Altogether 31 people were killed, among them a fireman and one man who was not identified until January 2004. It is with great fondness that on the anniversary of my father's death I remember him - and with sadness, all others who perished with him on that awful night. The horror of his tragic death will never leave me. I also convey my sympathies to those who suffered loss on the 07/07/2005. At the time, I was living in north London and working in an office in south-central London. I would normally work into the evening and catch the tube home. I would change on to the Piccadilly line at King's Cross, usually around 7.30pm. But on that day in 1987 - I began to get a really uneasy feeling at work as the afternoon progressed. I was often the last person working in my section, but it never bothered me. This day however, I felt really spooked. I just felt that if I didn't leave and get home, something terrible would happen to me. So that day I passed through King's Cross at about 7.10pm and headed home to Turnpike Lane. I never usually watched the news on TV, but for some reason that night, I put the TV on and saw the breaking news about the terrible fire. I was absolutely devastated. I was also worried for my flatmate Paul, who hadn't come home yet. Thankfully Paul arrived home soon after, with a friend from work. They were both in a state of shock and you could smell smoke from the fire on them. Their train had passed through King's Cross as the fire was breaking. The smoke had infiltrated the train and stuck to their clothes. I cried for days after. I felt such an empathy for the victims and their families. I took flowers to the memorial, and shed more tears. I felt like I had lost someone close to me, even though no one I personally knew had died. Later a clairvoyant told me that I had lost someone I'd had a strong spiritual connection with in the fire. It took me almost a year before I could face going into King's Cross station, and I would feel sick whenever my train passed through or stopped there. The charred smell seemed to linger forever. Now I live on the other side of the world. But every November when the anniversary comes, I remember King's Cross. And I say a prayer for those 31 souls who left us that day, and their families - and those of us who had such a narrow escape. I left work each evening at 7pm to make the 5-to-10 minute walk to catch the Piccadilly line tube from Baron's Court to Kings Cross as part of my journey home to St Albans. The previous week, my colleague had told me I had 3 days leave overdue and would I like to take it soon. I chose to take Wednesday 18 November to Friday 20 November off. I'm glad I did. The tube journey [to King's Cross] was typically 20 minutes from Barons Court and I would normally have been on the very escalator that caught fire, when fire broke out, reportedly at 7.30pm. I remember a cold shiver going through me when I saw the news flash around midnight that night and again on seeing the burnt out remains of that escalator - my escalator - on the front page of the morning newspapers. The thick hanging smell of the fire lingered in the tube station passageways for months afterwards. I use to ride the tube from central London to Walthamstow on the extreme end of the Victoria line. At the time of the fire I was on my way home and planned to change from the Picadilly Line to the Victoria line at King's Cross as usual. As I remember, I was engrossed in a copy of the banned book Spycatcher, bought from a newsagent's in the City a few days before. I decided, as we pulled into King's Cross, to finish my chapter and change at Finsbury Park instead. That snap decision may have saved my life. At the time of the fire I was living in West London and working in North London, using the Victoria and Piccadilly lines to commute. I normally changed from the Victoria to the Piccadilly line at King's Cross because the interchange at Green park involved a rather long walk. That evening I was particulary tired and feel asleep missing my usual changing stop at King's Cross. I awoke just past Kings Cross and cursed my luck at having to make the dreaded long walk at Green Park. To this day, I shall never forget the looks on my house-mates' faces when I walked in through the door that evening. They had been frantic with worry about me knowing that I usually passed through King's Cross at the time the fire started. I must have been on one of the last trains through before all hell broke loose there. To this day, I still realise just how lucky I was not being caught up in that disastrous event! I was an apprentice electrician for London Underground at the time of the fire. When it happened I was on annual leave, but as soon as I got back I was down at King's Cross working on the "reinstatement". When I first went down there around a week after the fire, it was just a charred black hole. There was a "spookiness" about the place, just standing at the top of the burnt-out escalator where the events had unfolded. It looked awful, but it was hard to believe that 31 people had died there. There was this continual "acrid" smell about the place. This slowly diminished during the year I was working there - that was until I went into a set of decommissioned toilets between King's Cross and St Pancras. The air had obviously not circulated that well through them, and they still smelt like just after the fire, and the memories came flooding back. I remember the machine rooms under the escalators through out the Underground system before the fire used to be disgusting places covered in oil and grime. But within a very short space of time after the fire they became so clean you could have almost eaten your dinner from the floor! My father, Stanley Hoskin, also worked for London Underground, and he had put up emergency lighting at Moorgate some 12 years before when I was just a child. He, however, had a more direct contact with the tragedy because he was down at Moorgate a short time after [the Moorgate crash] had happened putting in lights so the emergency services could see what they were doing. It affected him for sometime. These days they call it post-traumatic stress syndrome. I just remember he was somewhat "withdrawn". I was on my way home from my office in Warren Street. The tube pulled into King's Cross where I normally got off but this day the train stopped but the doors did not open. People were banging on the doors to let them in but the doors did not open and the train pulled off. I did not know what was going on until I got home to find very worried parents! The next day was dreadful as we had to get a bus from the train station and go past King's Cross - deathly silence and the hundreds of flowers are what I will always remember most about the scene. Makes me shudder even to this day. Needless to say I have not been on a tube since! I was on a train from Sheffield which pulled into St Pancras a few minutes before the flashover - I think a few other passengers on that train died. I walked into the ticket hall and saw the white smoke drifting over the ceiling. I hummed and hawed about whether to take the tube to High Barnet and decided that the fire would mean a delay so I would just get the overground to New Barnet instead. The decision - made on impulse - almost certainly saved my life. It can only have been seconds after I left the station that the flashover occurred. Inside the station it was actually quite calm, a naivety that will never again, I hope, be demonstrated in the face of such a problem. My girlfriend and I travelled up the escalator that caught fire half an hour before it started, on the way to the Barbican. On leaving the Barbican, you could smell the smoke and fumes coming down the tube from King's Cross. Scary to think that the fire had probably started as we travelled up the escalator. I was standing on the mainline concourse looking at the departures board, standing next to the underground exit, waiting for a platform to be allocated for a Peterborough train. I vividly recall the first smoke coming up from the exit. My first instinct was that a waste bin had caught fire. Silly of course - all waste bins had been removed due to the IRA bomb threats. Then I heard shouting and saw one or two people racing up the steps onto the concourse. Then suddenly the thin trail of smoke was a dense black thick cloud and within seconds the concourse was filled with smoke to within four or five feet of the floor. I ducked - the air was acrid - and ran for the nearest exit with several others still unaware of what was happening beneath my feet. It is strange how our essentially safe world lulls the mind into believing that any event "can't be that serious". The greatest shock came outside. Thick black smoke was belching from all the underground exits. If hell exists it was on display that night - smoke pouring and pumping out relentlessly into the night air illuminated by the yellow sodium lights. The longer I stood there the more it sank in that this was a major incident. But there was no evidence of casualties and I was not about to start looking or intruding on the emergency services. My first thought was to call home. No mobile phone back then - I had to find an empty call box. I walked in to St Pancras. It was like a scene from the 19th century - thin smoke filling the air of the cathedral like station fed by, I think, the sole underground exit located actually in St Pancras station itself. I called my wife and explained that she might hear or see something on the news about a fire at King's Cross but that I was OK. My call coincided with the first TV coverage. Just occasionally I now stop for a few seconds at the plaque on the King's Cross Underground concourse which commemorates those who lost their lives and think of the terror they must have endured that night and appreciate that had I been a few minutes later my name might have joined theirs. I had to stay later at work than was usual that evening, and went up the wooden escalator from the Piccadilly Line probably about two minutes before it burst into flames - which I suppose means that the fire had already started beneath the steps. It was very busy - both the moving stairs were full. The main things I remember is that the ticket hall was (as usual) crowded, and I had to jump over the bags of a number of soldiers who were buying tickets - I often wonder what happened to them. As I ran up the steps to the station I was also struck by how many policemen were heading down into the ticket hall. You normally saw the odd one, but that evening I passed four or five of them entering the station and ticket hall. I have often wondered whether this was a co-incidence, or whether there had already been a warning or alarm that they were coming to look into. Thinking back about how many people there were in the station at the time it is amazing the death toll was not far higher. I didn't actually find out anything about it until I got home - though my wife was obviously very worried, to put it mildly. I was outside on the street at King's Cross underground station about half an hour before it happened. I was about to walk down the steps into the Underground station when an old man happen to stand in my way begging for money, so I thought I may as well give him a �1 coin. Then as I was about to walk round him to enter the station, I suddenly saw a bus that would take me directly home to Hampstead instead of going by Northern Line, so I quickly changed my mind and caught the bus home. Later that evening I heard on the 9pm TV news of the fire at King's Cross. The escalator that caught fire I was going to use to go down to the Northern Line. Since then whenever I hear about the King's Cross fire, I think of the old beggar man that stood in my way at the entrance of the stairs to the underground. I was seven years old at the time of the disaster and can remember it as one of the first news stories I ever watched properly on TV. I remember seeing [firefighters] coming in and out of the entrance to the station that had smoke billowing out of it and seeing covered up bodies being wheeled out on stretchers, which was very harrowing. I remember going straight through King's Cross tube station on a trip with my dad not long after the fire, and remember how on the train I was on the name of the station had been blacked out by a piece of black tape. It was very haunting passing through a station where so many people had died. It's terrible that nobody has been prosecuted for negligence and that some of the worst injured survivors didn't receive full compensation.